Here's a list of the most common EyeQuant questions. Click on a question to learn more! When should I use EyeQuant? Should I use the URL grabber or image uploader? Why does the URL grabber only analyze websites above the fold? Why can't I upload a full page design file into EyeQuant? What types of design can I analyze? How do I analyze mobile designs? Can I analyze more than one image or URL at a time? What's the difference between ‘Engaged Visitor’ and ‘New Visitor’ model? How can I connect the Browser Extension? Does EyeQuant have an API? How do I download the EyeQuant results? How do I share the EyeQuant results with other people? If I need to add or remove users, what do I do? How do I keep track of my remaining analyses? I don't have enough analyses left on my account! What should I do? I accidentally analyzed confidential content with EyeQuant. What can I do? Does EyeQuant work for videos or animation? Will EyeQuant give any recommendations? Does it work for other cultures/demographics? What makes EyeQuant different from other heat maps? Does EyeQuant also work for websites outside of the eCommerce industry? Can I use EyeQuant to analyze product packaging? Who can I contact in case of billing inquiries? There is no significant difference in between the two options, so ultimately it's up to you. The URL grabber will simply take a screenshot of the webpage above the fold, and you can specify a preferred resolution size. The image is then analyzed exactly the same way as if you had uploaded the image file directly. For either option, you can also toggle between "desktop analysis" and "mobile analysis" before you upload an image file or submit a URL. Note: the URL grabber will take a screenshot of a page and could potentially include pop-ups and cookie notifications. If you don't wish to analyze a design with these elements, then you may wish to upload an image file directly, or use the Chrome Browser Extension, to maintain full control over what is analyzed. EyeQuant models a set of processes that occur in a user’s brain when they’re presented with a visual scene. In the context of websites, the "visual scene" is the screen. Since users don't see the entire length of the page on the screen at once, it would be unrealistic for EyeQuant to analyze the entire length of the page in one go. For that reason, when you enter a URL EyeQuant automatically crops the screenshots above the fold. You can change the resolution size of the screenshot before you hit the 'Grab page' button. If you want to analyze a live web page in its entirety, try using the Chrome Browser Extension to analyze screen size segments of the full webpage. For that reason, when you upload a full page design file EyeQuant automatically crops the image to the content above the fold. You can adjust where the fold cuts off, up to a point. The bottom line? Submit designs to EyeQuant in screen-sized segments, the way visitors will view it. Analyze full page designs in separate sections, as would be visible on the screen for various devices. Pages with extreme animation or motion on the page during the first 3 seconds of a user’s arrival. Pages written in languages that read in a downward or right-to-left pattern (e.g. Hebrew, Mandarin, traditional Japanese). 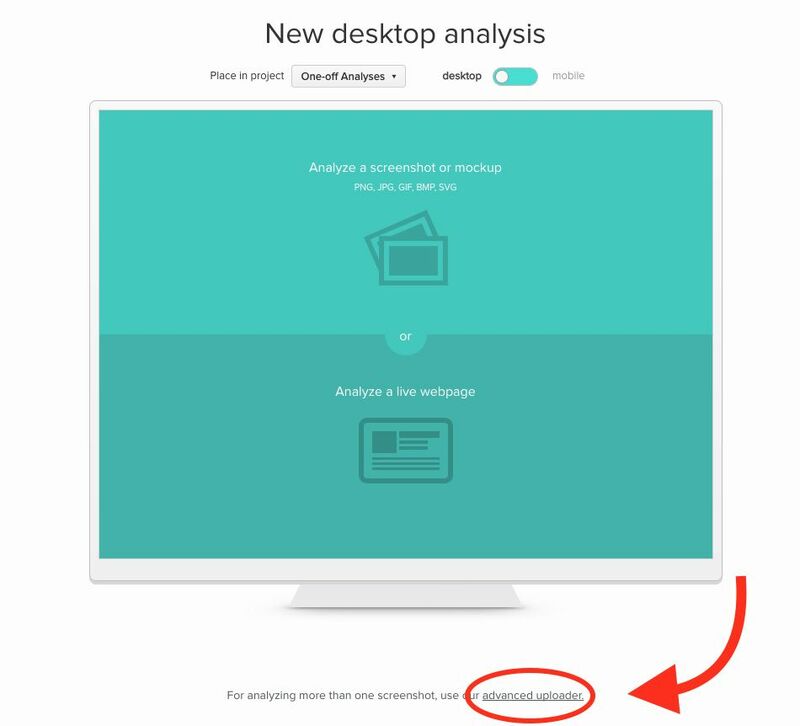 On the new analysis page within the app there's an option to toggle between a 'Desktop Analysis' and 'Mobile Analysis'. Simply toggle on the 'Mobile Analysis' option before uploading a design or entering a URL. We recommend using the 'Desktop Analysis' mode for for tablet designs; we don't currently offer a dedicated prediction model for tablet designs. 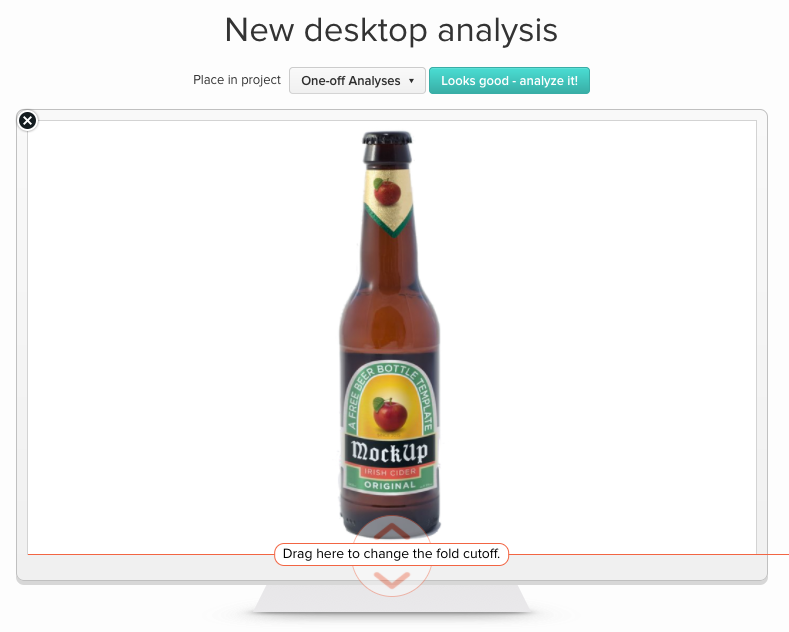 You can also use the Browser Extension for analyzing mobile designs. Learn more here! You can analyze up to 5 images at a time, or you can analyze up to 5 URLs at a time by using EyeQuant's Advanced Uploader. Engaged Visitor: This is EyeQuant's default model, and represents to most common occurrence of visitors to a page. Engaged Visitors can still be first time visitors, but have some prior orientation as to what this page is about before they arrive. They may have followed an ad campaign, a search link, or are following the intended user journey to a landing page. For example, if Jane clicks on an advertisement for Zappos shoes, even if she visits the page for the first time, she knows she'll be looking at a page for shoes. New Visitor: This model is much less common, and represents visitors who have no orientation before landing on the page. A New Visitor is a person who landed on a page (perhaps at random), and doesn't know if they will be looking at shoes or life insurance. You could imagine a New Visitor as someone who clicked on a bitly link, and therefore has to first orient themselves after landing on the page. 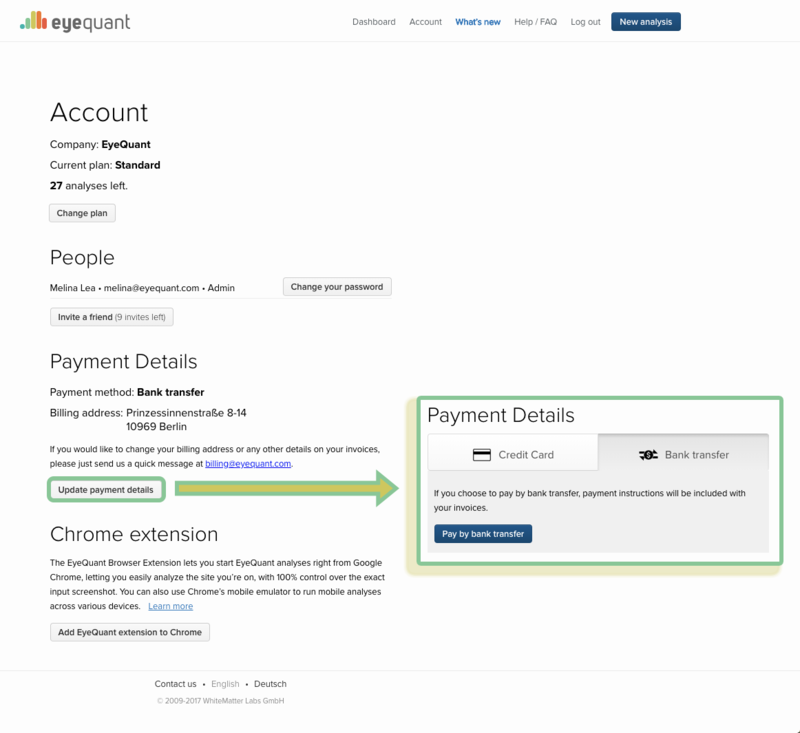 EyeQuant's Browser Extension currently works for Chrome browsers only. 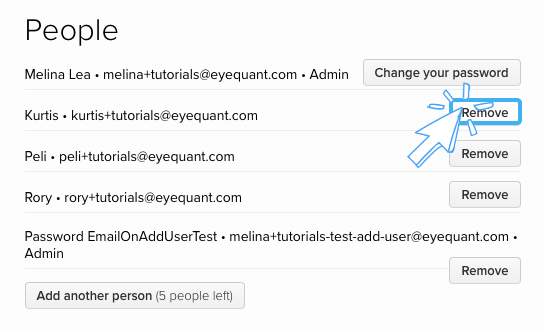 To connect the extension, visit the Account Page in your EyeQuant App. From there you'll be able to install the extension to your Chrome Browser. Once you've connected the extension, you'll be able to analyze any live webpage, exactly as you see it in your browser. This gives you full control over what is analyzed: remove pop-ups and cookie notifications, analyze below-the-fold segments, landing pages, etc. 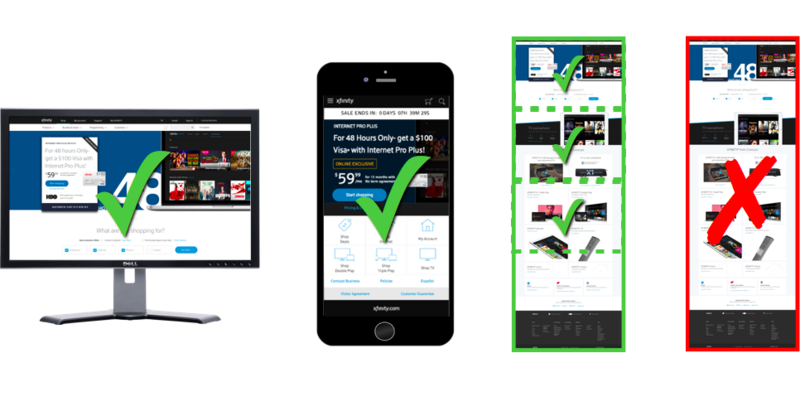 You can also analyze mobile responsive pages, and mobile pages more easily. Visit the Browser Extension help page to learn more! We do have a beta-API feature which is useful for some customers. The API would exist on your public website and allows your visitors to submit a URL and email address. They would then receive a PDF package via email with the EyeQuant results for that specific URL (above the fold) along with information you want to provide for your company/product. This feature is still in its beta-phase, but if you're interested in learning more, contact us! On the Results Page, each of these different maps contains a download "ghost button". Pressing this button will download the individual result as a PNG file, and can be found in your Downloads folder. Additionally, you can download each of these individual maps by using the Download drop menu on the Results Page. This drop menu also gives you the option to download the entire results in PDF, PPT, or ZIP format. And finally, you can download up to 6 different results at a time from a Project folder. Select the thumbnail(s) you wish to download from a Project, and then select the Download drop menu. You'll have the option of downloading the result(s) in PDF, PPT, or Zip format. Multiple results will be combined into one file format. The images below depict the different download options. You can share a single result with anyone, even if they don't have an EyeQuant account. This makes it easy to share analyses with decision makers, colleagues, and clients. You can always message us from within the app using Intercom. We'll get back to you as quickly as possible. Specifically, if you need assistance with your analysis results, if you have any questions related to the app and the product, or need help with your subscription details (including plan changes) you can contact Melina. 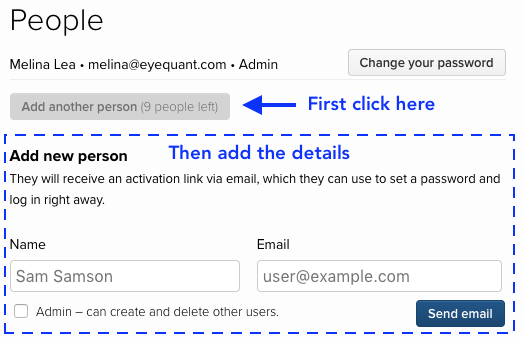 An Account Admin can add or remove users anytime from the Account Page. Not an Account Admin? You can request permissions from the Admin for your account. You can also contact us for help (for instance, if the Account Admin is no longer with the company). To view how many analyses you have left for the month, visit your Account Page in the EyeQuant App. You'll be able the view your account type and the amount of analyses remaining for the current month. Ready for an upgrade? Send an email to Melina! If you run out of analyses, or don't have enough to complete your project, we're usually able to work with you on a case-by-case basis. If you regularly run out of analyses each month, it may be time to upgrade your account! contact Melina to upgrade your account! Any time you use EyeQuant to analyze an image file or URL, it counts as 1 analysis. Anytime you use the Browser Extension, it counts as 1 analysis. If you analyze a page or design in different resolutions sizes, it will count 1 analysis for each different resolution size. For example, if you analyze a design for a desktop resolution, a laptop resolution, and a mobile resolution, it will count as 3 analyses. If you analyze something you didn't intend, or if you don't want other members of your account to see the results you can use the delete function. You can delete a single analysis, or multiple analyses at a time. You can even delete entire projects. If you need to make changes to your subscription, please contact Melina. If you're not sure whether you need to make changes to your subscription, Melina will be more than happy to talk to you about your options. No. EyeQuant analyzes static images, so it won't pick up on the motion in videos or animation. Not yet. The EyeQuant results will help you to visualize whether or not your design objectives are being met, and will help you identify areas for improvement. Since each design has different objectives, it's ultimately up to you to determine whether your design is successful at leveraging attention. You will determine if the clarity needs to be improved, and if the site is stimulating or calm enough for your visitors. If you would like help interpreting the results, or if you would like specific recommendations please contact us. The EyeQuant heat map is based on attention data, which is significantly different than a mouse-click heat map. 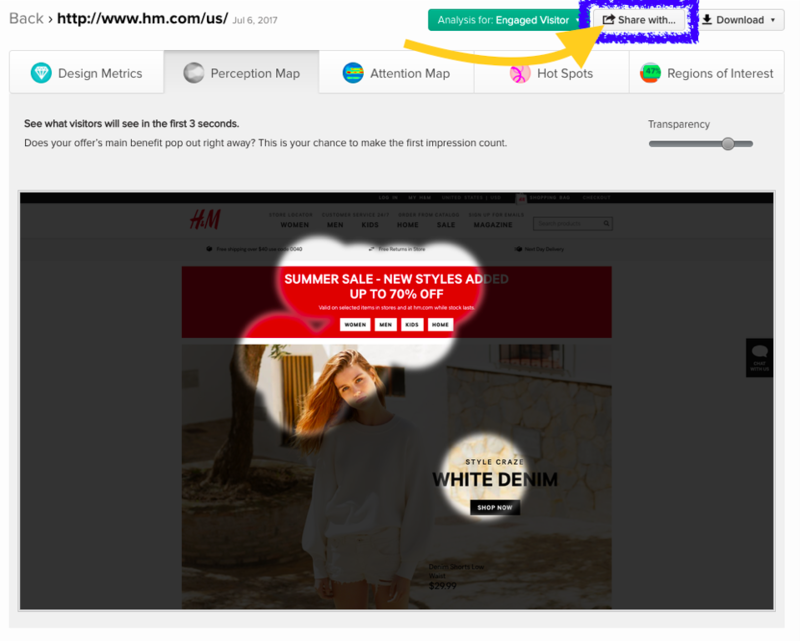 For example, EyeQuant indicates where visitors first look, versus where they click, or hover their mouse. We wrote an in-depth article about different types of heat maps, and what sets EyeQuant apart from the rest. Read the article here. Of course! EyeQuant can be used for any type of webpage, and can also be used on newsletters, marketing emails, printed articles, and more! If you're unsure, just ask! EyeQuant was used in part of a study which was related to packaging and choice. The study is called, " Simultaneous modeling of visual saliency and value computation improves predictions of economic choice". 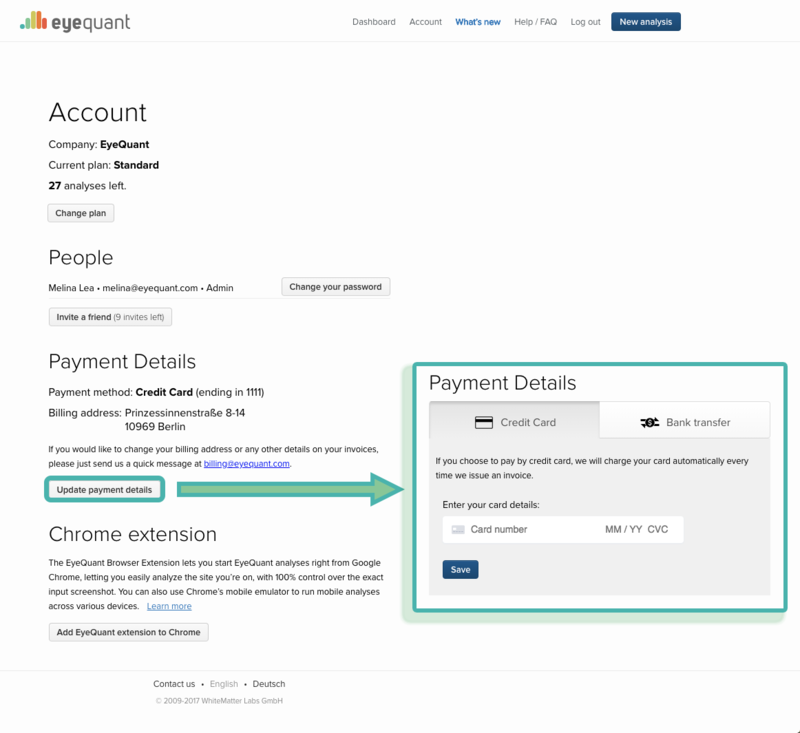 If you would like to pay your invoice by credit card, you can enter the card information into the Payment Details section on the Account page. Your card will be charged automatically every time we issue an invoice. Please note that we accept VISA, Mastercard and American Express credit cards. If you have any questions regarding your invoice or payments, please send an email to billing@eyequant.com. To request a copy of a previous or current invoice, please send an email to billing@eyequant.com.